Wireless backup cameras are ideal for every car owner helping him/her realize what is happening behind them. They play a vital role in helping you avoid slamming into other vehicles. Apart from these, the wireless backup cameras are important for security purposes. They can give evidence of an accident or anything that happens near your car. 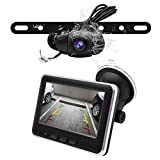 When you need to buy the best wireless backup cameras, an in-depth understanding of the major brands and features to consider is important. However, for your sake, we have reviewed the latest top ten wireless backup cameras just for you. Read through our reviews and choose a wireless backup camera that best suits you. This is a great pick to start our list with a good resolution of 600TV lines. The camera is powered by a 12V-24V DC power which is readily available from your car battery. It is a great buy that comes with an easy to install the monitor. This camera offers you a large viewing angle of 140 degrees and a 940 H by 576 V pixels for clear images. You can see what is happening behind you without ever turning your back. This is a cheaper wireless camera backup but one of the best-selling picks to give you good value for your money. 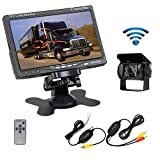 It comes with an RV monitor that sets up easily. The camera is IP69K waterproof and will work in all-weather without damage. It features 28 infrared lights allowing you to use it at night without any issues. It is sold as a complete kit with all accessories to install and two-year warranty service. The AUTO VOX is another amazing wireless backup design that is pretty easy to install. It requires a simple mirror binding to an existing one. This camera features a wireless transmitter something that takes away the hassles of connecting cables. There is 6 LEDs high brightness to offer you a great rear view and automatic on/off. 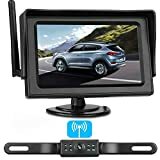 Overall, this is a quality wireless backup camera that can be used in all-weather. It is IP 67 waterproof and will not damage even when there is rain. With a classic 135-degree viewing angle, the ZSMJ is one of the leading wireless backup cameras on the market currently. It is a powerful choice with seven LED lights to allow for good viewing during the dark. The camera works on the 1/3 inch CMOS to deliver sharper, brighter and very clear images. The LED lights are one the best features that allow drivers to see even when the weather is bad. You also get a complete package of 4.3 inch TFT monitor, wireless receiver and a user manual. This is our second AUTO VOX camera on the list and a great pick that has been highly reviewed online. 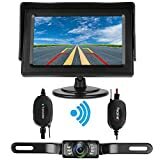 This VOX wireless backup camera is a great purchase if you’re looking to park safely. The wireless design allows for faster installation taking away the complications of video cables. The camera features a 4.3 inch LCD monitor for the rearview and IP67 waterproof capability. This simply means you can use it in rainy conditions without the worry of damage. There are six lumens lights for night vision or bad weather that automatically turn on/off depending on the conditions. This is a pretty simple camera that offers easy installation on the license number plate. It is a great buy that will offer you a 120 degree rear view allowing for effortless parking. The 4.3 inches LD monitor connects with easy and displays whatever the camera relays. You can be sure of getting clear and sharp live images of the rear view. It is waterproof and one of the best choices for a wide range of cars ranging from RVs to camping cars. 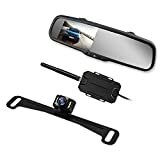 The BOSCAM K2 is a highly rated wireless backup camera that easily snaps on the mirror. It comes with an IP67 waterproof transmitter to work in all environments. 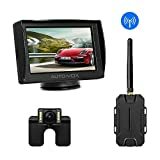 This is one of the best wireless backup cameras with a good resolution and clear images even from 100 meters. The viewing angle is wide and features adjustable lens. You can easily install this camera without drilling any holes. There is a further 600TVL that allows for night vision. The Emmako delivers some of the strongest signals from as far as 45ft on vehicles to ensure you always know what is happening behind you. However, this range gets even bigger in open areas to 66ft. It is a quality pick that features auto waterproof camera lens to work in any environment. Infrared LED lights on the camera enable you to see clearly at night on when the weather is not clear. 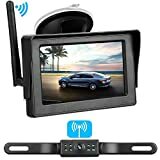 Overall, this s an amazing wireless backup camera with a rear view of 135 degrees. The iStrong is another exciting wireless backup camera that installs easily without pulling any long cables. It gives a clear view from as far as 66ft in open areas and 45ft when used on vehicles. This is a versatile camera that works well both during the day and night. It features seven IR LED lights that allow you to see at night. A clear image of what is happening behind your angle is given on the monitor with a wide 135 viewing angle. It is waterproof and has a monitor that you can power through the fuse box, light circuit or even the cigarette lighter. 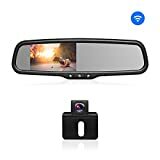 These are the best wireless backup cameras on the market currently and ones that can greatly enhance your safety on the road. They are highly rated and offer you good clarity both during the day and night. You can park effortlessly and safely when you have one installed behind your car.